Biz and Theresa talk about whether and for how long it's ok to be naked in front of our kids and vice-versa. And, as if that's not awkward enough, we also discuss names for all those body parts that are out there in the open! Plus, Biz solves part of the “poop in the tub” problem, Theresa's genius moment and failure are both thrilling and urine-related, and we talk to Al Watts, President of the National At-Home Dad Network. One Bad Mother's Day is coming up! Join us in a city near you! Thanks to Bump Glow Maternity for sponsoring this week's episode of One Bad Mother! Join our lively OBM facebook group for like-minded parents to share and discuss everything kid- and parenting-related! Non-parents are also welcome! Join here. 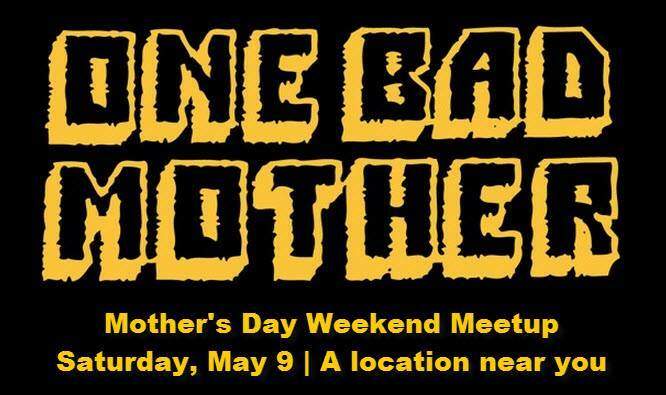 One Bad Mother Listener Meetups on Mother's Day Weekend! In honor of Mother's Day (and just because we want to hang out with each other), we're making Saturday, May 9th an international meet-up day for One Bad Mother listeners! We have meet-ups scheduled in a bunch of cities, and more meet-ups are being organized as we speak! Check back here for updates, we'll be adding cities as we get the details. If you're not seeing your city below and you're interested in organizing or attending a meet-up, connect with other listeners in your area using our facebook group! Notes: You can bring your kids to play on the playground, or the splash pad, or just run around. Then we can catch some brunch/lunch at Phoenicia. Baby-friendly, other kids optional. It's outdoors in Minnehaha Falls Park, so we're hoping for nice weather! Anyone can join the Twin Cities OBM Meetup group for more info on facebook. UPDATE: Due to major construction where we were originally planning our meet-up, we have had to change the location. We are now meeting at the playground in front of the Cambridge Public Library. Lida will have a yellow balloon tied to her stroller and will be wearing her OBM t-shirt. POSTPONED! But please join the KC group on FB for coordination of a future meet-up date! Green Lake Park – Playground. Tables near the swing sets as a meeting point. Courtney will be wearing her superman t-shirt (and maybe carrying a baby in a gray Ergo). Kids and partners welcome. One Bad Mother Episode 98: When Only Mama Will Do, plus guest Janelle Hanchett! Biz and Theresa tackle the tangled topic of hair! To cut or not to cut? That is the question. The answer is, “No one cares.” Plus, Biz Leaves It To Beaver, Theresa totally eats it in this week’s fails, and we get outdoorsy with Peter Brown Hoffmeister, author of Let Them Be Eaten By Bears: A Fearless Guide to Taking Our Kids Into the Great Outdoors.